The Highways Agency has been widening the A23 between Handcross and Warninglid - a vital transport link between London and the South Coast – to make journeys quicker and safer and to improve access to Gatwick airport from the south. 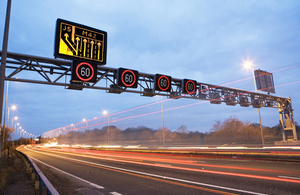 It is part of a record investment in roads in the South East, the largest since the 1970s. Improving the A23 has been an enormous task, and the project team has worked tirelessly to deliver these vital improvements in a way that kept traffic moving throughout, with a strong safety record – and at 20% less cost than the original estimate for the project. There is still some resurfacing to be completed and this will be carried out overnight to allow drivers to enjoy the additional capacity during the day. When the third lane has opened, work to resurface the A23 either side of the improved sections will continue until November using overnight carriageway closures. The resurfacing will be carried out overnight, between 8pm and 6am, using carriageway closures. Clearly signed diversions will be in place via the A264, A24 and A272. Dates of the remaining closures will be publicised in advance and drivers can sign up to receive email updates via the website.